Description: An Arexx script for MPlayer, that enables to play radio and TV streams. streams. It is based on MUI via RxMUI, so you can change its look very easy. occasions I had to install Arexx again. -Assign MPlayer: assign mplayer: "your:path/to/mplayer"
-Wget should be assign too or placed in c: drawer. 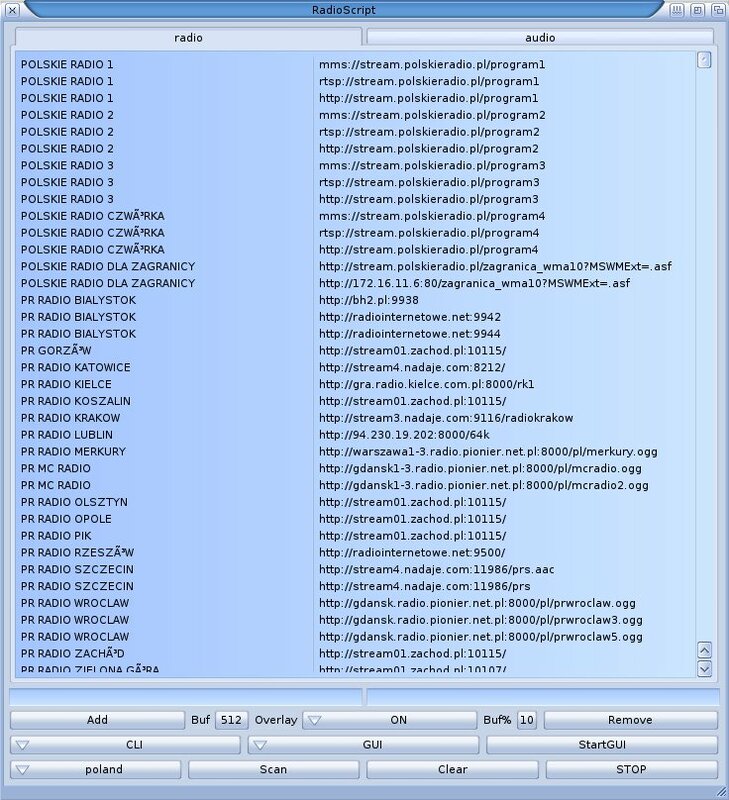 - 'radio', the main area list.class object, contains names and addresses of given country stations. Double click on the selected position activates playing. - 'Overlay' useful to watch TV stations. - 'Buf%' indicates what part (%) of the buffer has to be filled up to commence the process of playing. MPlayer - quite useful, particularly if some station is loaded first time or cost problems before. - 'GUI' - loads the MPlayer GUI. - 'StartGuI' starts MPGUI independently. - 'Clear', frankly clean the list above but not delete it. Useful if one want to try some new address. Virtual Surround Sound (but the bigger factor the larger distortions). what is worse, during the shut down, jamming MPlayer and the corresponding AHI chanel, e.g. could be easy edited by any text editor. - During the shut down RadioScript saves positions of 'country', 'Buf' and 'Buf%' gadgets. - Attention needs to be paid to the fact that RadioScript was tested in MorphOS machines only. - It is essential to rescan the countries database from time to them. not ask for any money.